as3-arduino-connector is a native extension to connect Arduino Prototyping board to Flash apps. The ArduinoConnector mimics the flash.net.Socket class that is internal to the Flex Framework. It provides you with methods to read and to write data to the Arduino serial port. 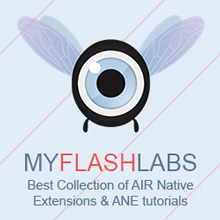 Air Native Extension, Mac, Windows Mozilla Public 1.1. URL.